A new study finds the majority of clubs are failing to meet guidelines that have been in existence for over a decade. 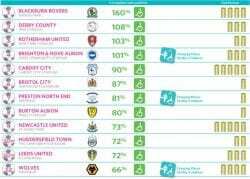 Following the shock findings of last year’s investigation of accessibility at Premiership clubs, national disabled people’s charity Revitalise has today published an Accessibility League Table of Championship clubs, revealing that many are missing the mark when meeting the accessibility requirements of disabled supporters who are wheelchair users. On the eve of the new season, the charity found that only four clubs in the Championship had the recommended number of spaces required for wheelchair users, according to guidelines that have been in existence for over a decade. The study is good news for Blackburn Rovers, Derby County, Rotherham United and Brighton and Hove Albion – all exceeding 100% compliance with the UEFA’s recommendation for wheelchair spaces, published in the Accessible Stadia guidelines back in 2003. All four clubs find themselves at the top of Revitalise’s ‘Footie4All’ league table – released today in the form of a colourful infographic, with Cardiff City, Bristol City, Preston North End and Burton Albion all following closely behind. Finding themselves close to the accessibility relegation zone of the table are Norwich City, Sheffield Wednesday, Birmingham City, Nottingham Forest, Aston Villa, Barnsley and Wigan Athletic – all of whom are achieving less than 50% compliance. Propping up the table and performing the worst when it comes to accessibility for disabled supporters are London clubs Fulham, Queens Park Rangers and Brentford – each achieving less than 25% compliance. Revitalise previously conducted a survey of disabled supporters to gain an insight into their overall match day experience and the improvements they would like to see made in the future. Of these improvements, disabled fans cited a better view of the action (57%), the chance to be with friends (55%) and more wheelchair spaces (53%) as the top three areas that they would like to see clubs make progress. The Accessible Sports Grounds Bill, currently being passed through Parliament, will enable local authorities to enact discretionary powers whereby they can refuse to issue a safety certificate where they consider, or have been advised that, the ground does not comply with the ‘Accessible Stadia’ guidelines, published by The Sports Grounds Safety Authority. 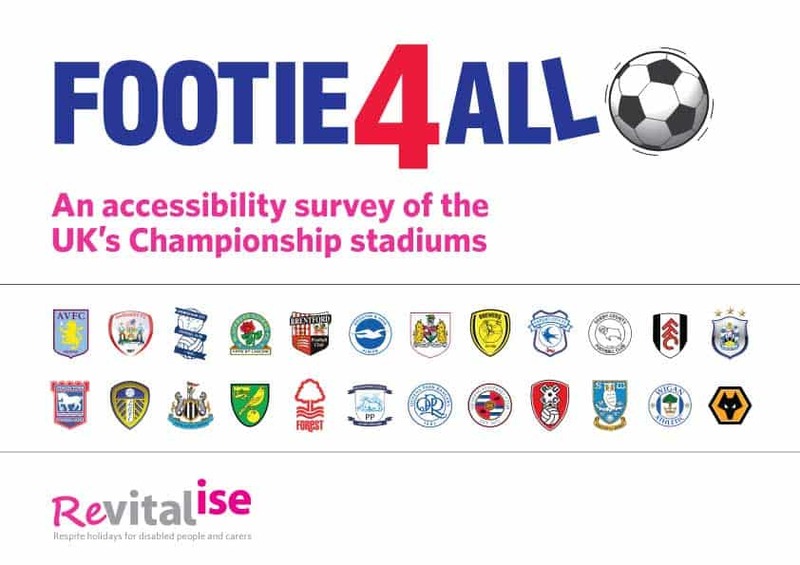 Revitalise is using these findings as evidence that more needs to be done to accommodate and include disabled supporters as part of the match day experience offered to fans and is calling for Championship clubs to up their game and meet their obligation to disabled supporters as set out by the Equality Act by installing more and better facilities for disabled fans. The charity is also urging the Championship clubs to comply with the Accessible Stadia Guidelines – as they already agreed to over a decade ago – or risk falling foul of the new law which could empower their local authorities to close them down if they do not do so. “This coming weekend the Championship will kick off for another season, but our study shows that for people who rely on wheelchairs, going to the big match might not be the joyful experience they had hoped for and it is down to the clubs to put this right. “Our study found that only four Championship clubs have been able to comply with simple guidelines that were laid down well over 10 years ago! There can be no excuse for the 20 remaining clubs to still be lagging behind. The Premiership has pledged to become fully compliant by August 2017, so we are urging the Championship to follow their lead. “Look at newly-promoted Burton Albion. This club has a stadium a quarter the size and a turnover of just one fourteenth the Championship average, yet this little club has achieved a wheelchair compliance of 80% – and in the process has put many much bigger, richer and better resourced clubs to shame. “As we speak there is a new law passing though the House of Commons which will give local authorities the right to close stadiums down if they do not comply with the Accessible Stadia Guidelines. Would it not make good sense for the Championship clubs to do the right thing by their disabled fans now, rather than run the risk of losing their right to stage football at all?